Black walnut, Juglans nigra, may also be known as eastern black walnut or American walnut. The bark is black, thick and deeply furrowed. When scraped with a knife, it reveals a chocolate-covered sub-surface. The twigs are stout, greenish or orange-brown in color, and may be hairy or smooth. The pith (inner portion of the twig) is dark brown in color and is partitioned (chambered) when sliced with a knife. 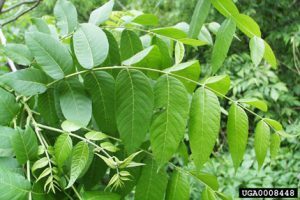 The leaves are alternate (occurring at different points along the twig), and pinnately compound. A black walnut leaf may be made up of 15-23 leaflets. Each leaflet may be 3 1/2 inches long and 1 1/2 inches wide. Therefore, the entire leaf may be 1 foot long or longer. The leaflets are broadly lance-shaped and pointed at the tip. They are rounded and asymmetrical at the base. The natural range of black walnut is western Massachusetts and Connecticut, south to the North Carolina coast, southwest through Georgia and westward through the Gulf states to eastern Texas, north through Oklahoma to southern Nebraska, and eastward through the southern regions of the northern Lake states. It is scattered in New York and can be found in extreme southern Canada. Black walnut leaves, fruits and twigs contain a chemical called "Juglone" which is alleopathic. It is a growth inhibitor to some species of plants such as tomatoes or apple trees. Therefore, never plant a walnut tree near these species you wish to grow. This is nature's way of eliminating competition so that the walnut tree is able to take up all available nutrients. Unfortunately, other plants are alleopathic to walnut trees. These are fescue grass and goldenrod. These species should be eliminated by herbicide if you are growing walnut trees. The latest heyday of black walnut occurred in the 1970's when walnut was king and prices went through the ceiling. 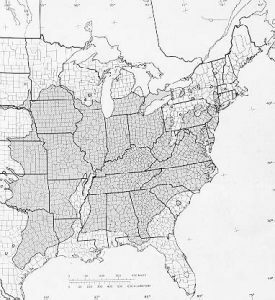 Since then, because of economic factors, export tariffs, and preferences for lighter woods, walnut temporarily took a back seat to black cherry, red and white oak, pecan, and even sugar maple. Black walnut is now making a comeback and is competing with black cherry and white oak as one of the fine North American hardwoods. The tree once grew abundantly in the eastern bottomland forests, where the soil was deep and rich. Trees 150 feet tall with 50-foot clear stems and 6-foot diameters were not uncommon. Black walnut was the number one prized fine hardwood in America at a time before the use of veneers.